The understanding of synthetic biology is slowing percolating through the plant science community. Whereas the microbial research community started to adopt this technology a decade ago, it is only over the past five years that plant scientists are becoming aware of the possibilities that might exist when using the principles of synthetic biology in their research. In 2012 New Phytologist held a synthetic biology workshop whilst in 2013 GARNet hosted a plant synthetic biology meeting that aimed to set the agenda for the coming decade. In addition and perhaps more importantly, the BBSRC chose to fund the joint Cambridge-Norwich OpenPlant initiative as one of its centres of synthetic biology. The principles of synthetic biology put great importance on the ability to easily switch between the DNA parts used in different experiments. Widespread uptake of synthetic biology is dependent on a significant amount of front-end design and planning to prepare and define universal cloning strategies and then provide the DNA parts that might be used by a downstream researcher. To that end a number of cloning strategies are available that might fit this bill, each which their own benefits and drawbacks. 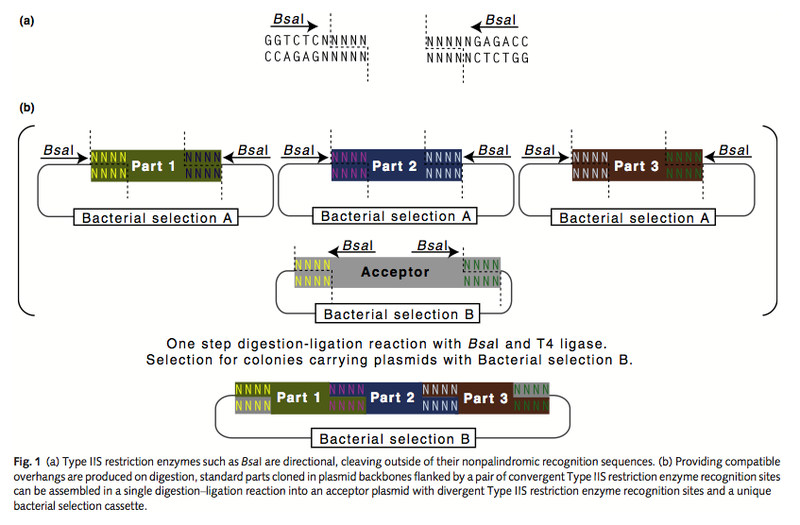 These include ligation-based strategies such as Goldengate/MoClo/Goldenbraid or overlap based methods such as Gibson Assembly (reviewed here). Therefore with this backdrop, an important Viewpoint article was recently published in New Phytologist where a collaborative of ~50 plant scientists define: ‘Standards for plant synthetic biology: a common syntax for the exchange of DNA parts’. This work is led by members of the OpenPlant collaboration, namely Dr Jim Haseloff at Cambridge University and Dr Nicola Patron who is Head of Synthetic Biology at The Sainsbury Laboratory in Norwich. In this article the authors introduce the Type IIS assembly method (otherwise known as MoClo assembly) as a common mode of production for DNA parts for plant synthetic biology. Importantly the article sets out the aims and future principles of plant synthetic biology as having analogy with mechanical or electrical engineering, wherein (DNA) parts made by multiple manufacturers (researchers) are immediate interchangeable, which facilitates and enables technological innovation. The power of MoClo/GoldenGate cloning comes in the use of the BsaI enzyme, whose 6bp non-palindromic recognition sequence is physically separated from a 4bp restriction site (whose sequence is unrelated to the recognition site). The design of these 4bp ‘fusion sites’ is critical for the modular assembly of DNA parts in MoClo, where multiple parts can be fused within a single reaction using a range of fusion sites across the entire transcriptional unit (TU) (see Figure 1 from Patron et al (2015)). This Viewpoint article describes 12 ‘parts’ that span a TU from 5’ promoter regions through to 3’ termination sequences. However previous articles have introduced many more DNA parts that are already available to researchers interested in this technology, for example, the 96-well MoClo Tool kit or the items available on the GoldenBraid 2.0 website. In these collections each DNA part is held within an Universal Acceptor Plasmid (UAP) and can be mixed and matched to create many functional units as long as the ‘fusion units’ match up along the length of the clone. However across the grand scheme of things, the specific nature of these parts is mostly irrelevant. What is most important is that DNA parts that lie in a similar position within any TU contain the same fusion sites so that they can correctly fit into an amalgamated clone at the functionally relevant location. If this is correct then a TU can be made up of any number of available parts designed for a specific regulatory function. Therefore one future aim of this technology might be to generate a plasmid library that includes the entirety of Arabidopsis promoter sequences, which would all contain the same directional fusion sites so that each of them could be used to drive expression of any particular gene of interest. Maximising the potential of synthetic biology resources will come as the availability of parts increases. Of course having the DNA parts available is one thing but understanding how they work in different biological contexts is an entirely different question. As researchers looks to use a range of experimental ‘chassis’ such as Arabidopsis, Tobacco or Marchantia then it might be necessary to provide DNA parts that have been optimised for each ‘chassis’. So what does a lab researcher with their ‘clone of interest’ need to do to take advantage of this type of synthetic biology resource? Firstly their clone needs to be ‘domesticated’ which, in its most simple terms, involves removal of any internal BsaI sites. As with any cloning reaction, this may not be trivial since it involves two overlapping PCR reactions to incorporate a single mismatch designed to destroy the internal BsaI site. As an aid, the GB2.0 website contains an optimisation tool to help this process. The researchers clone of interest is fully ‘domesticated’ into the UAP by addition of the appropriate 4bp fusion site that will allow cloning into the correct location of any designed TU. The power of this system truly emerges when considering the vast range of possible regulatory regions that can be attached to the clone, all of which are held within an appropriate binary vector for plant transformation*. With this Viewpoint article the UK plant synthetic biology community proposes that, given its ease of use, any future DNA parts repository might be best based around MoClo-type technology. However this does not prevent the use of other useful assembly technologies and in time, it might be possible to link seemingly disparate cloning strategies to provide a truly universal mode of DNA-part preparation. Providing incentives for academic researchers to develop parts for the community and ensure they get appropriate credit for doing so. Investment in the hardware and software infrastructure to support the physical location of a repository and the upkeep of that facility once it is established. Continued support for wider synthetic biology so that the DNA parts can be used to fully develop the technological capability of the burgeoning bioeconomy. Finally it is worth noting that although all the synthetic biology tools can be provided for researchers to use, if the individual researcher is unable to amplify their (cursed?) gene of interest then it might all be for nothing!!! Therefore it is vital to keep supporting basic skills in research so that a fundamental knowledge of molecular biology is not lost to following generations. *- A discussion of transformation efficiency into both model or non-model plants is beyond the scope of this blog, even though it remains a potential bottleneck in many organisms. I was facing some problem in understanding the Synthetic biology so for that I’m looking for a source where I can understand and I found your blog. You have explained it in a better way I think and I’m also looking for biology tutors near me to have some guidance to understand my subject. I’m thinking that I should research more to understand about DNA parts for plant synthetic biology, after reading your post I have developed interest in this topic more than other. I also thinking to become a biology tutor so that I can help students.